A comfy bed and room! Situated off tiny Thomas Circle at 14th and M Streets in the heart of Washington, D.C., The Donovan hotel exudes contemporary design and comfort. 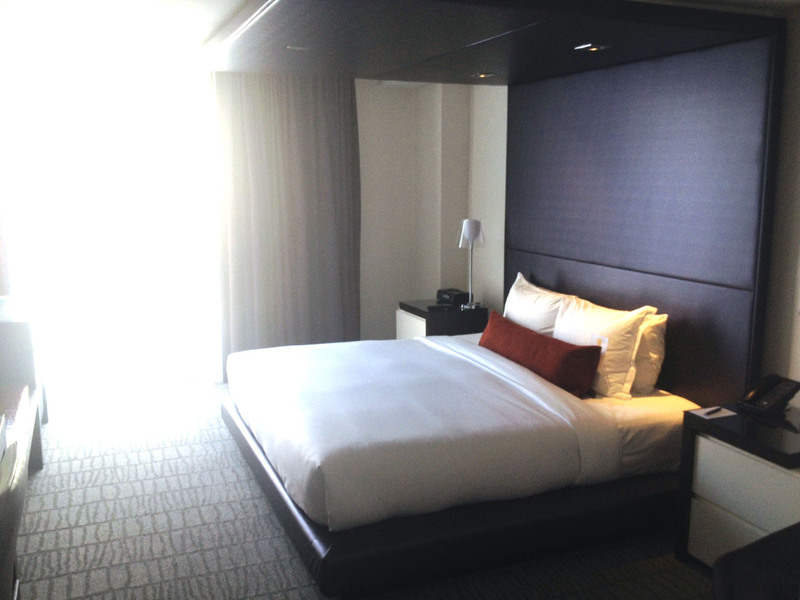 Here’s our review of this trendy hotel. Swing chairs from the future. 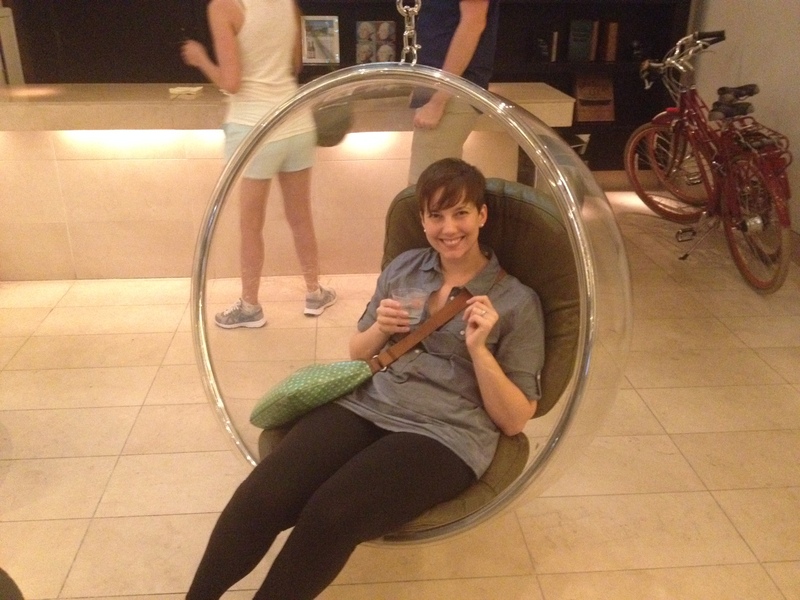 Upon entering the cozy lobby, guests see the spacey orb chairs dangling from the ceiling. Adjacent is the bar, which provides free wine during Happy Hour every day (5-6 p.m.) and fruity water the rest of the day. Part of the Kimpton collection, The Donovan also boasts a rooftop pool, which, unfortunately, was only open until 5 p.m. the days we were there. That’s a bit of a bummer for people like us who like to unwind at the end of the day in the pool and not the adjacent rooftop bar. 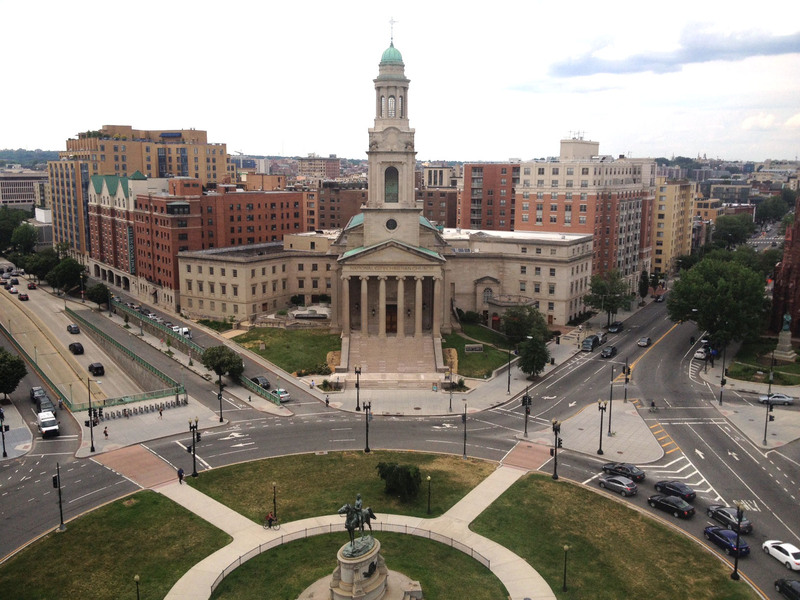 The view of Thomas Circle from the top of the hotel. Not too bad. It’s better for those who like to walk up 14th Street to look at all the hip boutiques and to dine at the numerous eateries, but it’s also three blocks from the Metro and just a block from the bus stop. A Whole Foods Market is about a 10-minute walk away, and a CVS is located right across the street for essentials. It’s interesting: We technically stayed at The Donovan twice—once for four nights for our main trip and an additional night once we needed somewhere to hole up after the Southwest Airlines fiasco of 2015. Both were different experiences. The four-night stay was in a large, executive king room with pretty purple leather paneling and modern décor. 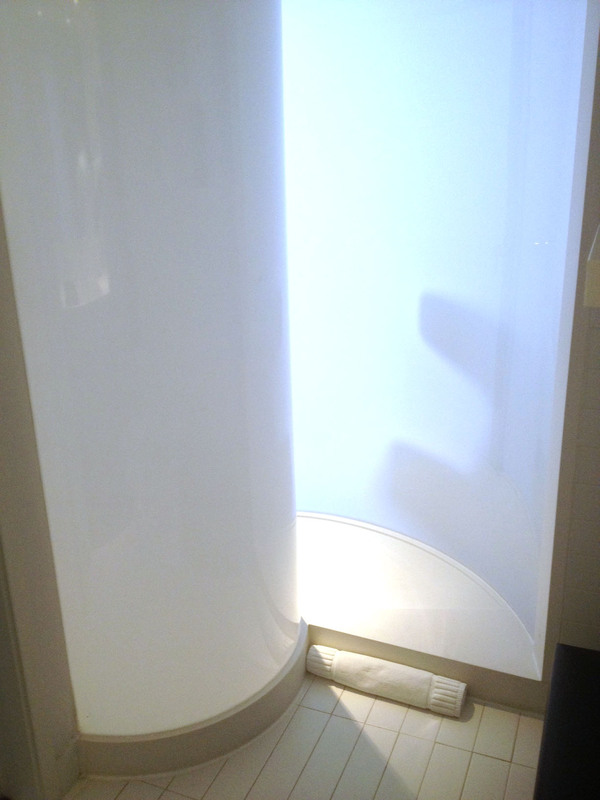 Even the bathroom looked futuristic, with a shower that resembled the shape of a shell. The additional night stay was less exciting: Smaller room, smaller bathroom and a shower that Caitlyn said “looked like it belonged in a prison.” So, um, maybe ask for the non-prison shower room when you check-in? Some rooms do have deep-soaking tubs, but good luck getting one (we tried putting in a request months out and were foiled). The TV lineup was adequate — heck, we didn’t even have to miss an episode of Game of Thrones! There’s also a yoga mat in the closet and a yoga channel on the TV if you need to get that stretching in. 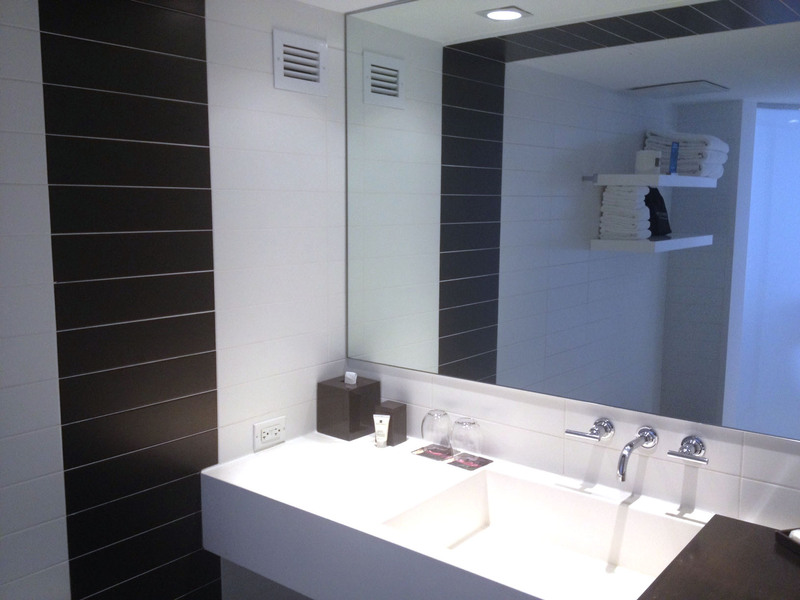 Pretty standard bathroom, but still plenty of space for two to move around in simultaneously. I highly recommend joining the customer loyalty club, Karma Rewards, if you plan on staying at a Kimpton hotel. The free membership entitles you to a free $10 credit at the mini or real bar, as well as free access to the wifi. At roughly $200 a night (that includes taxes), the hotel was a good deal, although, we did have a 20% coupon through Karma Rewards. The front desk was nice enough to extend that deal once we arrived back where we started, sweaty and tired, and needed to stay an additional night. All in all a great experience at The Donovan. Just make sure you get one of the bigger, newer rooms.